With the holiday season fast approaching, many of us are beginning to think about the gifts we need to buy and what we hope to receive. It’s easy to get caught up in the latest trends of toys and technology, but one gift that keeps giving are books. Yes, books! Books may seem old-school to a few, but understanding the gift and power a book has is anything but boring. Reading books aloud to children offers many benefits to their development: books allow for more exposure to language, can increase a child’s vocabulary, and can increase a child’s imagination. Reading books early in life can help create a love of reading, which can last a lifetime. There is always a new adventure to find behind every book. When children are read to regularly, they often have a larger vocabulary, understand more complex words, and have a better understanding and use of grammar. Reading books also helps children understand concepts such as letters, rhyming, identifying objects in pictures, asking/answering questions, and provides quality time for you and your child. When should you start reading to your child? Literacy skills can begin as early as 3-months of age, which may be seen when your child shows interest in a book by patting or chewing on it. 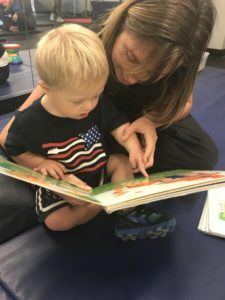 This does not mean that parents need to begin reading to their children at 3 months of age, but it should let parents know that their child is beginning to develop literacy skills by being interested in a book. 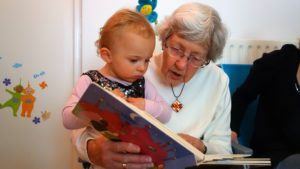 Some studies have indicated that the best time for parents to begin reading to their child is at around 8 months of age. So, let’s talk about some great books and where to find them. A fan favorite is of course the bedtime story “Goodnight Moon” by Margaret Wise Brown, who tells the story of a bunny saying goodnight to everything around it. Additional books may include the beloved Dr. Seuss books such as, “Oh, the Places You’ll Go”, “The Cat in the Hat”, “Green Eggs and Ham”, “One Fish Two Fish”, etc. ; the list of Dr. Seuss books goes on and on! More books for beginner readers may include “Curious George” by Margaret Ray, “Goodnight Gorilla” by Peggy Rathman, “Brown Bear, Brown Bear, What do you see?” by Bill Martin Jr. and Eric Carle, “The Very Hungry Caterpillar” by Eric Carle, and “Guess How Much I Love You” by Sam McBratney and Anita Jeram. For children that are in the 1st grade or higher-grade levels, some books that they may enjoy include: “Magic Tree House” by Mary Pope Osbourn, “Junie B. Jones” by Barbara Park, “Magic School Bus” by Joanna Cole, “Dog Man” by Dav Pilkey, and “Captain Underpants” by Dav Pilkey. Books can be found in many different stores and online. The price of the book you are looking for may depend on where you buy it. Stores like Walmart, Barnes and Nobles, Half Price Books, and Target typically offer a larger selection of books at a reasonable price. Nowadays, it is easy to find and buy the book you are looking for online; sites such as Amazon offer convenient searches to find exactly what you want and are also reasonably priced. Parents can also buy books directly from the author’s or publisher’s website. Books and the ability to read are gifts that lasts a lifetime. Books improve vocabulary, imagination, and literacy skills that will continue throughout a person’s life. As the holiday season approaches, consider getting your child or children some awesome books and open them up to a whole new world. A new adventure awaits behind every page! Happy Reading!